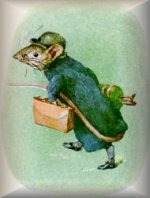 When up the sandy path all spick and span with a brown leather bag came Johnny Town-mouse! As teachers, we tend to jump on such fragments as errors, probably more heavily than we should. 1. You have come at the best of all the year, we will have herb pudding and sit in the sun. 2. One place suits one person, another place suits another person. Many writers would use a colon or a dash in the first sentence, since the second main clause explains why it is the "best" of all the year. A semicolon would probably be the choice of many writers for the second sentence, since the clauses imply a contrast between "one" place and person as opposed to "another" place and person. The main point here is that the rules of punctuation are not as clear and rigid as many people think. Neither of the splices makes its sentence difficult to read, so there is no "error" here. It is a matter of style.